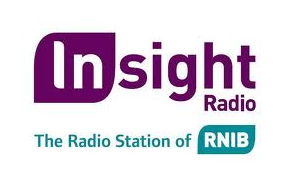 RNIB's Insight Radio has secured a place on Freeview. It's available on channel 730 in a slot advertised by multiplex operator Arqiva in February. Broadcasting 24 hours a day, the Sony Award winning station communicates the needs, interests and aspirations of blind and partially sighted people throughout the UK. The station is also carried on Sky, Freesat and in Glasgow on 101 FM. As well as covering news, sport, entertainment, talking books and social opportunities, in-depth feature interviews and lifestyle programmes address a wide range of issues affecting the blind and partially sighted community. Insight Radio's presenters are all either blind or partially sighted. The station says "This results in informed, intelligent and in-touch broadcasting." In 2007, its first broadcasting year, Insight Radio won a prestigious Silver Sony Radio Academy Award. The judges described the winning programme as "a niche service which would never be accommodated on a mainstream radio station and contains some of the most moving and well-produced human interest content the judges had heard in a long time." The Insight team were very proud to have won this award.